The deadline to submit letters of interest for Water Infrastructure Finance and Innovation Act (WIFIA) loans has been extended to July 31. 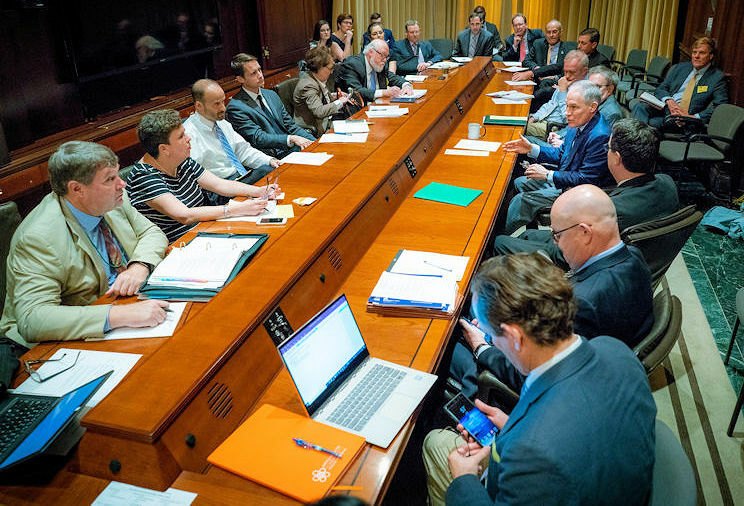 On May 15, U.S. Environmental Protection Agency (EPA) Administrator Scott Pruitt (fourth from right) announced the extension of the deadline to submit letters of interest for Water Infrastructure Finance and Innovation Act (WIFIA) loans to water sector association staff. Photo courtesy of Eric Vance, EPA. U.S. Environmental Protection Agency (EPA) Administrator Scott Pruitt announced the extension during a meeting with the Water Environment Federation (WEF; Alexandria, Va.) and other water sector associations on May 15. Pruitt also sent a letter to governors and heads of territories informing them of the new deadline. The loan program, created by the 2014 Water Infrastructure Finance and Innovation Act (WIFIA), subsidizes loans for large water projects. Currently, EPA is accepting the second round of applications. Letter of Interest Frequent Questions.